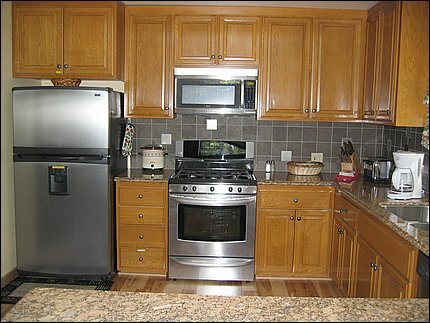 Our Kitchen has been totally remodeled with new granite, tile, and appliances. Kitchen includes new high-end appliances from Kenmore Elite. Kenmore Elite Gas Convection Range with warming drawer and large microwave. Kitchen is fully equipped with more than you will find in most vacation rental homes! Enough silverware for large groups. Enough dinnerware for large groups. Enough glassware for large groups. Extra cabinet space and containers to store your food.